Termite Control Tips For Your Home - Yes Pest Pros, Inc. Termite Control Tips For Your Home - Yes Pest Pros, Inc.
As big and strong as your house is, it is crazy to think that something as tiny as a termite can ruin it. Termites are small (usually less than an inch to be exact) but they can do big time damage to your home if you let them. Termites cause billions of dollars of damage to homes and businesses every year, but there are steps you can take make sure your home is not one of them. They love moisture, so they feast on the moistened wood in your building foundation. That is their entry point, and they will work their way up and through your walls! As you may already know, termites can be a huge hassle and liability. The best way to deal with them is to stop them before they become a problem. 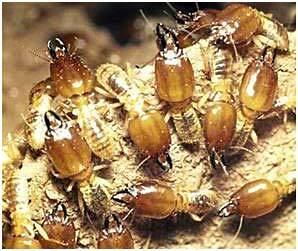 The following are termite control tips to help keep your home safe. Seal cracks in foundation- As previously stated, the foundation is the entry point. The more spaces for them to squeeze through, the more access they have. Keep moisture away from your foundation– Moisture is the magnet that attracts termites. Ensure that there are no area where water can pool. Clear away any debris that could hold moisture. Keep your yard clear of discarded wood. Fix leaks of any kind- A leaky pipe, roof or gutter can lead to wet wood. You already know what that means. Clear leaves from gutters and foundation- Do not allow leaves to build up in your gutters or on your ground against the foundation. This is termite invitation. Check nearby trees for infestations- If there are infested trees in your yard, it won’t be hard for those termites to make their way over to your home. Keep crawl spaces and attics ventilated- You may not think about your attic and crawl spaces often, but they can be breeding grounds for termites because of the moisture that can build up there. Making sure they are properly ventilated will prevent this problem before it starts. Keep wood coated with paint or other protective barriers- Properly protected wood is of no interest to termites. These tips can save you thousands of dollars in home repair, but if you are beyond the prevention stage, Young Environmental Solutions can step in to keep the damage from getting any worse. We will start with a free evaluation and then offer specific, cost effective termite control solutions based on the level and type of infestation.